The Panasonic SR-G06FG is one of those small rice cookers that could beat out a lot of more expensive competition! Granted, that is if you are in the market for something very easy to use and don’t have many mouths to feed. Simply put, this unit offers just that! A small amount of well-cooked white rice in under half an hour, easy clean up, and no hassle. For it’s low price (at time of review), this appliance is perfect for single cooks or couples with no kids. Great for all Rice Types? For folks who enjoy regular plain white rice, this unit will prepare it just as good as rice cookers of a much higher price tag. Moist, fluffy, soft white rice every time. However, if long grain wild rice or brown rice is more on the menu, while the Panasonic SR-G06FG can handle it just fine…don’t expect it to be perfected since it does not utilize even heat cooking or “Fuzzy Logic” technology. It will not be terrible though, just not to the texture or consistency as units offering specific settings for these rice types. Also expect to yield less cooked cups with brown rice as well. For white rice this small Panasonic rice cooker prepares up to 9 cooked cups. Another great benefit folks love about this small rice cooker is that it does not take a lot of room on the counter. Its round design makes it perfect for corners or up against the wall, and while the cord on the Panasonic SR-G06FG is not the longest there is plenty to find an outlet. Quick Note: for white rice it is recommended you measure no more than 3 cups and rinse the rice several times before cooking to help avoid boil-over. Adding a tablespoon of olive oil and/or some powered chicken stock should also help solve the issue. We believe that if you are on a tight budget and are single, this rice cooker is a great buy. 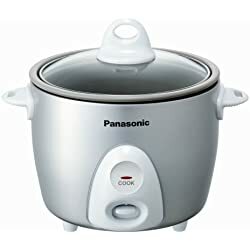 Please remember that even though the Panasonic SR-G06FG model may sometimes be advertised as a “rice steamer”, it does not come with a steamer tray for vegetables, nor does it allow for steaming vegetables while cooking rice. For people who would benefit from that additional feature, we recommend checking out both the “Cuisinart CRC 400” or the “Aroma ARC-733G” (see Navbar under brands or cup sizes). But overall this Panasonic unit is a great quick-cooking personal rice cooker for the money.